For the second time in seven months, a defending UFC champion has pulled out of a title fight against Conor McGregor. UFC lightweight titleholder Rafael dos Anjos (25-7) has withdrawn from a scheduled defense against McGregor in the main event of UFC 196 on March 5 with a broken foot. McGregor (19-2), the current featherweight champion, has not yet been pulled from the card. Sources said the UFC is looking at potential options to keep McGregor on the Las Vegas pay-per-view event. The Irishman was looking to make history against dos Anjos by becoming the first fighter to hold titles in multiple weight classes simultaneously. 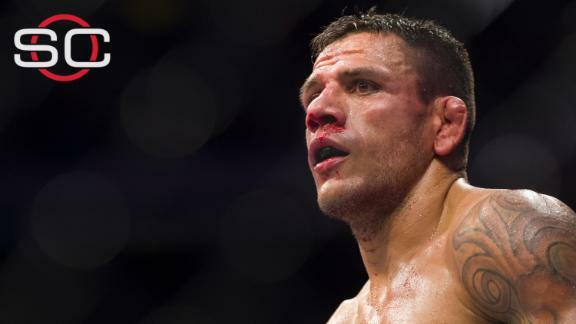 Dos Anjos' manager, Ali Abdelaziz, said the broken foot is expected to take six to eight weeks to heal. The situation is reminiscent of July 2015, when then-featherweight champion Jose Aldo withdrew from a defense against McGregor on less than two weeks' notice with a rib injury. McGregor eventually fought Aldo at UFC 194 on Dec. 12, defeating the longtime champ via knockout in 13 seconds. One potential replacement for McGregor is recent lightweight title contender Donald Cerrone (29-7). Cerrone's manager, Josh Jones, told ESPN that Cerrone has already expressed interest. Cerrone, 32, lost to dos Anjos in December and just returned Sunday as a welterweight. According to Jones, Cerrone currently weighs approximately 174 pounds, but he would cut as much as possible to get the fight. The UFC could also considerNate Diaz (18-10) of Stockton, California. Diaz is coming off a decision win against Michael Johnson in December, and McGregor's camp has expressed interest in facing him previously. Andre Pederneiras, Aldo's coach, told Brazilian news outlet Combate that Aldo wouldn't be ready to take the fight on short notice. Abdelaziz, who also manages featherweight Frankie Edgar, said Edgar was considered as a replacement, but he is currently dealing with an injury that could also keep him out for as much as eight weeks. UFC 196 will take place at MGM Grand Garden Arena. A female bantamweight title fight between Holly Holm and Miesha Tate is slotted as the co-main event. ESPN MMA writer Brett Okamoto discusses the impact of Rafael dos Anjos pulling out of his fight with Conor McGregor due to injury.